Glam Runner running tutus are available in 10 colors and adult and children sizes. Check out our Tutu Colors & Styles page for color combination ideas. Mix one, two, three, or more of the colors to create a unique Glam Runner running tutu just for you! NOTE: When ordering a tutu think about whether you are going to wear the tutu around your waist or lower down on your hips. Most adult runners tend to prefer running with their tutus somewhere between their waist and hips. In the chart above we’ve referenced this as the “low-rise” area. When placing your order please indicate whether you are giving us your waist or “low-rise” size. 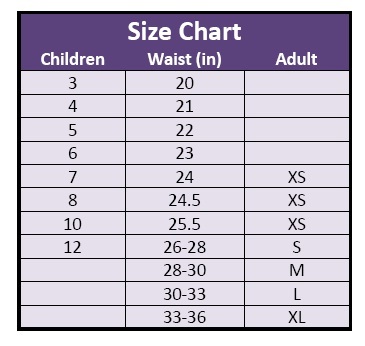 For example a size medium adult woman (with a 30in waist) who wants to run with the tutu around her hips would order a “Low-Rise” medium in a 33-35in waist.